France is the largest wine producing nation in the world, but it is the quality which makes her reputation. Similarly, France exports only the finest spirits. Cognac and then Armagnac are at the top of the list. The combination of the soil, climate and distilling and aging process are unequaled anywhere else. If you've ever been to Cognac, you have experienced the delight of smelling Cognac the moment you step into town. This is called the "angels portion," the evaporation of nearly 1% per year as the brandy ages in the cask. Distillation of this spirit began in the 17th century and soon attracted a following in England, Holland and Scandinavia. In 1887 Cognac was divided into regions: Grande Champagne, Petite Champagne, Borderies, Fins Bois, Bons Bois and Bois Ordinaires based on decreasing proportions of chalk in the soil which increases the earthiness of the taste. Nine litres of wine are made into one litre of brandy through a two-stage distillation process. The brandy is then aged in oak barrels from Limoges for 5 to 100 years which gives it its distinctive taste from the tannin and resins from the wood, the oxygen from the air and the rich amber color. Plan a picnic on the banks of the Charente and then tour the distilleries and taste this rare brandy: Hennessy, Martell, Rémy-Martin, Otard. 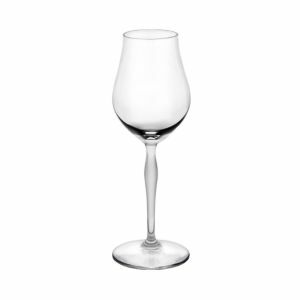 A classic silhouette and crystal craftsmanship make this glassware a striking addition to your tabletop. 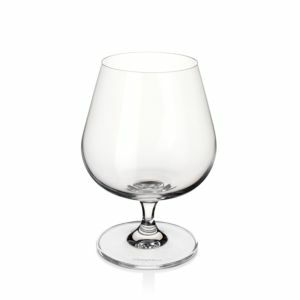 Mouth-blown, opalescent, and engraved brandy glass. Acquit Régional Jaune d'Or: certificate which guarantees that the brandy comes from Cognac. age: Brandy improves in wood for about 50 years. The cost and loss through evaporation are large which is reflected in the price. Once in the bottle, brandy doesn't age. Armagnac: brandy produced in the Department of Gers and aged in casks of Gascony black oak. brandies: distilled wine usually aged in wood. Laws fix the geographic limits of the areas which may produce under the Cognac or Armagnac labels. Cognac: brandy distilled from wines made from grapes of the Charente and Charente Inferieure Departments. Generally recognized as superior to all other brandies. Fine Champagne Cognac: from the Champagne area which should be the best. Fine de la Maison: a restaurant's house brandy--usually not Cognac! Grand Champagne: the small district where Cognac is located and which produces the best quality Cognac. limousin oak: from the Limoges area, used to make Cognac casks. stars: more stars indicate better quality. Determined by the producer so this will vary from one brand to another. Cognac. The rest of your life will wait. Inspired by the eponymous Irish castle, the Lismore pattern is crafted in thick, premium-quality cut clear crystal. 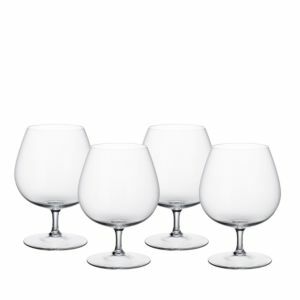 With sparkling sophistication, these brandy glasses are perfect for fine entertaining or enjoying everyday drinks in grand style. Each holds 12 oz. Fine spirits deserve the full treatment. 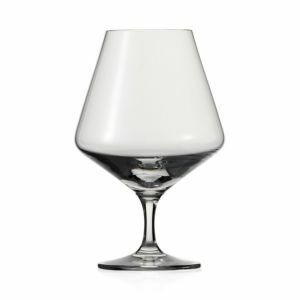 The Elegance brandy glass is shaped to enhance every nuance of your favorite brandy, from scent to color to taste. With a wide, mouth-blown bowl in sparkling Waterford crystal, it enriches every sip with a perfect unity of style and function.